Not to mention good old Smithy and his aeronautic skills! 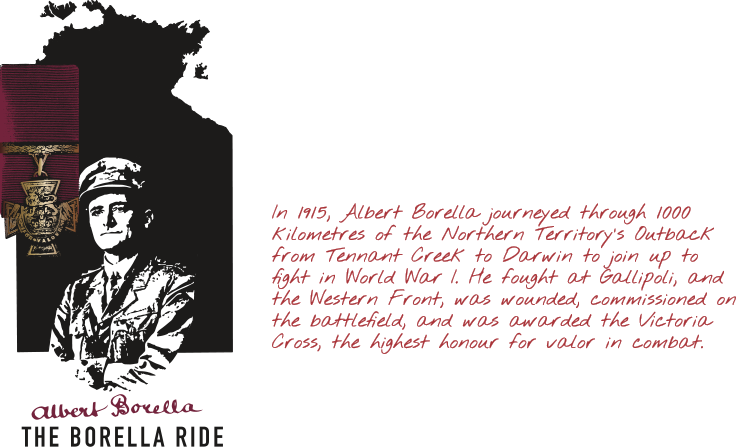 In this year of proud centenary, I give you Bert Borella! Where he acted in employment as their charismatic cook! Lace your boots and saddle up, we’re goin’ for a ride! No Barkly Highway paving, No, it’s bush that we’ll be braving! With a blister and some sunburn then you borrow someone’s horse! And it’s not a time for stalling – there’s a foreign battle calling! Over troughs and peaks and flooded creeks, the daily drama drifts! And we hitch a lift to Pine Creek where the railhead tracks extend! His comrades swear profoundly that he saved their bloody lives! In other words, go forth my friends and please… enjoy the ride!